The Samsung’s Galaxy Tab 4 8.0 now available on AT&T carrier. In New York at AT&T’s annual holiday preview. The At&T carrier is showing off its latest devices, including the Samsung Galaxy Tab 4 8.0, which available online beginning July 15 for $269.99 with a two-year contract, or for $369.99 outright. 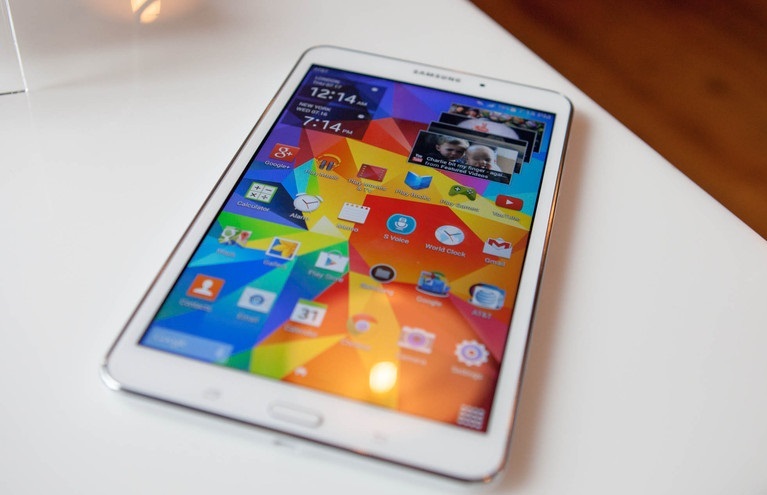 The Samsung’s Galaxy Tab 4 is coming with a nice technical specification. This tablet has a 8-inch display which has 1280×800 resolution, and the tablet is Snapdragon 400 quad-core processor, which is packed with 1.5 GB of RAM, and supports the LTE connectivity with WIFI and Bluetooth features are also present in the tablet. Performance-wise, the Galaxy Tab pretty smooth. This tablet should suit casual users pretty well, its Snapdragon 400 processor is enough to keep KitKat and TouchWiz running pretty quickly. And in terms of TouchWiz, this is the same version shipping on all Samsung tablets at the moment – just as crowded, bloated, and useful as ever.You can check out our review of the Galaxy Tab 4 8.0 here while you wait a few more days before it hits AT&T’s shelves.